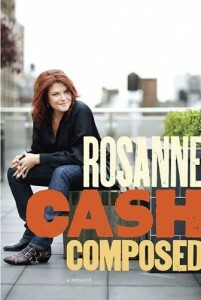 Rosanne Cash (firstborn child of Johnny Cash and Vivian Liberto) simply exudes talent. Her fourteen albums have charted eleven number-one singles. She is the author of a collection of short fiction, Bodies of Water, and the children’s book Penelope Jane: A Fairy’s Tale. Her essays and fiction have appeared in The New York Times, Rolling Stone, and New York magazine. Her latest work, Composed, a memoir, is getting scads of rave reviews (Washington Post, Chicago Tribune, LA Times, Boston Globe, The Atlantic) and is currently at #20 on the New York Times Bestseller List — after only slightly more than a week after hitting the shelves! Awaiting the Flood was fortunate enough to meet up with Rosanne backstage at a recent performance/reading at Agnes Scott College in Decatur, Georgia, and she was gracious enough to sign a couple of copies of her book for us despite our incoherent and fawning blather. One book will go into our archives and the other will go to one lucky reader. So, drop us a line at Contests[at]CountryMusicPride.com (our parent site) or simply leave a comment here. We’ll choose a winner at random on Friday, August 27th. Remember to include your email address so we can contact you if you’re the chosen one. I’d love to win this book. I like to read before I go to sleep at night. Please enter my name in the drawing for the signed Roseanne Cash book. I will get a copy eventually, but a signed, free copy would be even better! Thanks. I enjoy Mrs. L’s writing. Loved her reading and interview at the Saban! Articulate and heartfelt as her songs. Since Rosanne is not coming to Austin for a book signing, the winner should probably come from here. I enjoy Roseanne’s tweets and would love to get my hands on her book! Please enter my name in your drawing. This would be such a treat to own (and read, of course). I recently read an excerpt and loved, loved, loved it. I’m in love with her most recent album and recently her her talking about this book on the radio. I’m dying to pick up a copy and dive into it, and a signed copy would be a treasured keepsake. I already have a copy (reading it now; it’s terrific!) but if I win a signed copy I’ll give the unsigned one to a friend. I had the pleasure of seeing Rosanne record at Austin City Limits this year and she was fantastic. Really looking forward to reading her memoir! Looking forward to reading Roseanne’s new book! thanks for being real and transparent RC..
Smart and funny. And a lovely singer. When Roseanne Cash talked to me, via Twitter, I glowed for days. I’d love a copy of her new memeoir, Composed. I will be buying it, but if I can win a signed copy, I’ll glow again. Am purchasing this book soon anyway an autogrphhed copy would be nice also. Thanks for this opportunity. Count me in as an @rosannecash tweep who’d be honored to have a signed copy. Her tweets are the best – I’m thinking the book will be just as good. Please put me in the drawing. I’ve started reading the book already (love it!) but would really adore a signed copy. I have enormous respect for Ms. Cash. I would like to read her memoir to see if she includes asvmany #hashtags there as on Twitter. I am quite fond of the hashtag. i would love to have this. she is such an amazing person! Rosanne is one of my favorite folks on the Twitter. If she writes like she tweets, the book must be excellent. Count me in for the contest! I love Rosanne Cash! She is an amazing woman. AND funny as all get out on Twitter. i want a signed copy of ‘composed’ please pick me! Excited to perhaps win this book – RC is a great twitterer; makes me smile every day! I am so pleased to see Rosanne’s book receive such praise and success – having an autographed copy would be a delight. Cheers! I admire her work…and enjoy following her on Twitter. What a great find. I came to this site via No Depression and now have a new favorite site. The review of Rosanne’s book was just an additional bennie. Would love to have a copy.